After entering your task’s description all you have to do is tap one button to set when the task is to be performed. View your current set of tasks only, or all your tasks - you decide. It can be distracting to see tasks that aren’t due yet. 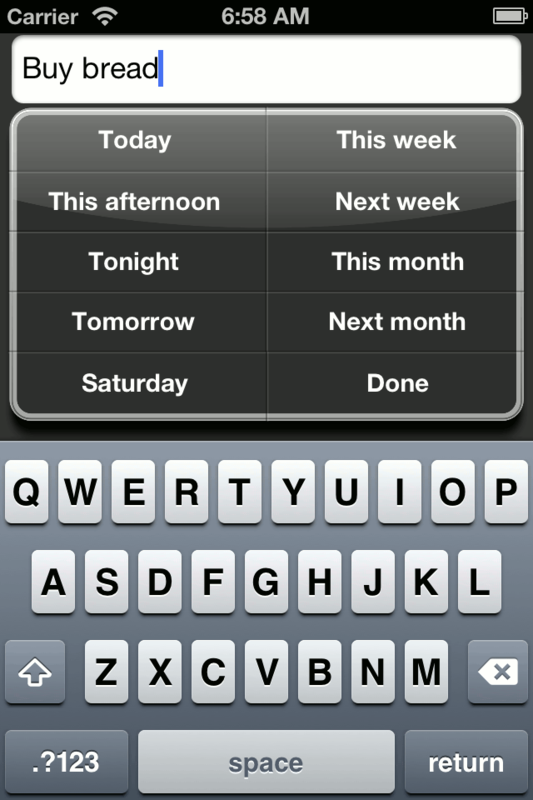 DelayTask only shows you the tasks whose date or time has been reached, hiding others from view. For example, if you press “Tomorrow” the task will disappear from your “Current” list, only appearing again the following morning. If you want to view future tasks you can do so by tapping the “All” button. Rather than enter dates using a calendar you use natural terms such as “Today”, “Tomorrow”, “Next Week”, requiring less thinking on your part. When a period of several days is selected such as “This month” or “Next week” DelayTask will look at the dates in that range and assign the task to the least busy date in the period selected. No tapping to mark a task done and having it continue to stick around. Just swipe and tap to delete forever. Uses the full screen on the iPhone 5.